REDMOND, Wash.–(BUSINESS WIRE)– The Nintendo games launching in the first part of the year are going to include some fun amiibofunctionality. Games like The Legend of Zelda: Twilight Princess HD for the Wii U console and Mario & Sonic at the Rio 2016 Olympic Games™ for the Nintendo 3DS family of systems, both launching in March, use a wide variety of different compatible amiibo figures. Some new amiibo figures will also launch in March, including the legendary Wolf Link amiibo that is included in every physical version of The Legend of Zelda: Twilight Princess HD, as well as three new figures in the Animal Crossing amiibo series, featuring fan-favorite characters like Timmy & Tommy, Kapp’n and Rover. The previously announced Ryu, Roy and R.O.B. (Famicom Colors) amiibo figures will also launch in March. When the physical version of The Legend of Zelda: Twilight Princess HDlaunches on March 4 at a suggested retail price of $59.99, it will include a beautiful Wolf Link amiibo figure based on the same character from the classic game. Purchasing The Legend of Zelda: Twilight Princess HD and Wolf Link amiibo bundle will currently be the only way to get this amiibo figure. When tapped to the Wii U GamePad controller, this legendary lupine opens the Cave of Shadows, a challenging new bonus dungeon in the game. After completing the Cave of Shadows, players can save their remaining hearts to the Wolf Link amiibo, and then use those hearts inside the Cave of Shadows to replenish life energy. After conquering the cave, players can save a record of their remaining hearts to the Wolf Link amiibo and attempt to beat their score at any time. 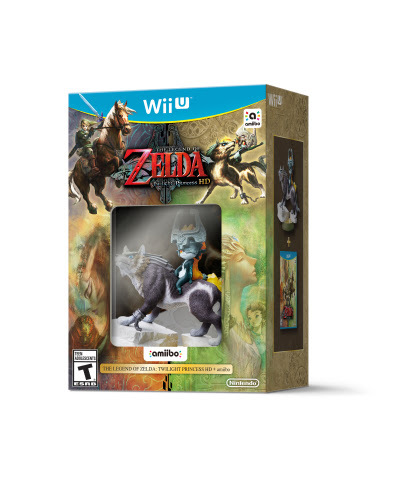 Some of the data stored on the Wolf Link amiibo figure can also be used with The Legend of Zeldagame for Wii U, which launches this year. More details about this functionality will be revealed in the future. In addition to the Wolf Link amiibo, other amiibo figures in the Super Smash Bros. series like Link, Toon Link, Zelda, Sheik and Ganondorf will work with The Legend of Zelda: Twilight Princess HD. By tapping the Link or Toon Link amiibo, players can replenish their arrows. Tapping Zelda or Sheik will refill the player’s hearts, while, in a devious twist, tapping the Ganondorf figure will actually make Link take double the damage! On March 18, new amiibo figures in the Animal Crossing series will launch in stores, including characters like Timmy & Tommy, Kapp’n and Rover. Digby will also be made available as a stand-alone amiibo. The next series of Animal Crossing amiibo cards also launches in March, bringing the grand total of available amiibo cards to be used in games like Animal Crossing: amiibo Festival for Wii U and Animal Crossing: Happy Home Designer for Nintendo 3DS to a whopping 300. Let the collecting begin! Fans who are ready to compete in Rio de Janeiro with Mario, Sonic and the gang in Mario & Sonic at the Rio 2016 Olympic Games will also have to warm up their amiibo-tapping fingers. When the action-filled game launches for Nintendo 3DS on March 18 at a suggested retail price of $39.99, both Mario and Sonic amiibo figures will be compatible*. By tapping the Mario or Sonic amiibo figures to the New Nintendo 3DS system (or on a Nintendo 3DS, Nintendo 3DS XL or Nintendo 2DS system using the NFC Reader/Writer accessory), players can boost Mario and Sonic’s outfits with that character’s power for the day. To celebrate the 20th anniversary of Pokémon, some of the Pokémon amiibo will be made available again at select retailers. Fans should be on the lookout for Charizard, Jigglypuff, Greninja and Lucario to once again return to shelves right next to Pikachu. Finally, Star Fox Zero delivers a new beginning for the classic shooter series. With a unique control scheme that uses both the TV screen and the screen on the GamePad, players pilot multiple vehicles through intergalactic levels with Fox and his classic crew. The game launches exclusively for Wii U on April 22 and will feature amiibo compatibility. More details will be revealed at a later time. For more information about amiibo, visit http://www.nintendo.com/amiibo. *Games, systems and amiibo figures sold separately.